You’re going to either love me or hate me after you try this recipe I’m about to share. It’s just THAT delicious, and you *might* just find yourself eating an absurd amount and you *might* fall into a sugar induced coma…then go back for more. The kids and I made my Gram’s famous buttercream Easter eggs today, and I posted a pic of the girls finishing up the chocolate stage (their favorite part, obvi). So with her blessing, I thought I would share my Gram’s beloved eggs with YOU. There’s just something about handwritten recipe cards, am I right? This one is dated 1984. I was FIVE. It’s even more special when that loved one is no longer with you. When you see their handwriting staring back at you…there’s just a comfort there, and suddenly you can almost feel their amazing, warm, squishy hugs. (No one ever has nor ever will hug like my Gram. SERIOUSLY. Ask any one of her grandkids, they will say the same). Some of you know the story, but if you don’t…we live in what was once my grandparents’ house. The only owners have been them and us. So every time I bake one of Gram’s recipes, I always think about the connection…I’m in Gram’s kitchen, looking at Gram’s recipe…it’s surreal. And incredibly awesome. We have been so happy here, and I know she’s just beaming watching her great grandkids grow up in this home, enjoying her food. She was quite the baker. Weddings, parties, each and every birthday – Gram was the one who brought the dessert. 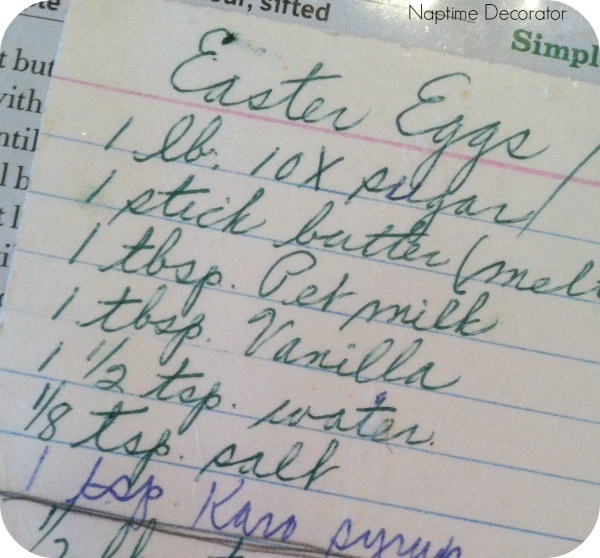 And certain recipes, like this one, really take me back to being a kid, coming to her house at Easter to visit…and now that house is mine and I’m making these eggs with my kids. Surreal, I tell you. Lay some wax paper on a plate or small cookie sheet. Make egg shapes out of the mixture – you can make them any size you want. Gram always made them large, but I usually make them smaller. (Maybe it’s so when I devour an entire egg I don’t feel QUITE as guilty;). Totally up to you. If you want, you can add coconut (about a cup or so), or chopped nuts, whatever your heart desires. We love coconut in this house, so I added it to half the mixture, and left half just the delicious buttercream. 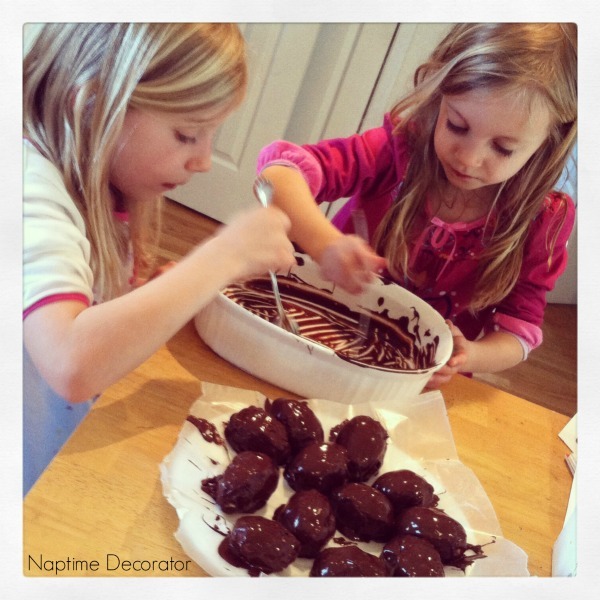 Place the eggs on the wax papered plate, stick in the fridge for a few minutes while you get the chocolate ready. 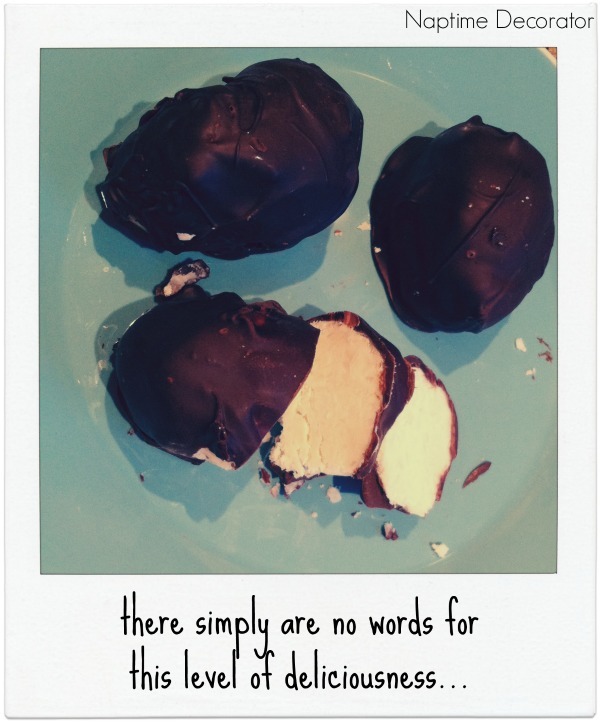 I use a large microwaveable container and empty a bag of my favorite chocolate morsels. For this, I usually use Nestle Dark Chocolate morsels. I nuke it at 30 second intervals, stirring after each round, until it’s all melted. Take the eggs from the fridge, and roll each one in the melted chocolate, using a spoon (or two). Place it back on the wax paper when you’re done. This part is messy, just embrace it;). Repeat for each egg, and pop the plate back in the fridge for them to harden. Doesn’t take too long, maybe half hour to an hour? Dig in, and try not to eat every last one. They look so yummy, can’t wait to try them! So glad you saved Gram’s hand written recipe and so glad you treasure it! Easter blessings to you & yours! Liz, you are amazing! This is so nice! Of course I was crying! And Grace agreed with your description of Gram’s hugs! I miss those hugs! Thank you for carrying on the traditions so beautifully! Happy Easter ! What is Pet milk? I’ve never heard of it! Recipes are meant to be shared. I cherish every hand written one I have, I have gone digital but I scanned them and made a family memory cookbook filled with pictures and comments about different events so each and everyone has that special hand written memory. Our handwriting is so personal as our own face. I have had family friends request copies too because our table always had friends included. May your family be blessed, thank you for sharing. Should be a nice thick consistency right away. These are amazing, dangerously amazing, especially since I keep most of these ingredients in my house at all times. Thanks for sharing! My gram used to make these and a Peanut butter version too! Delish! How much powdered sugar does it call for? 1 pound? I can’t quite tell. Thanks!